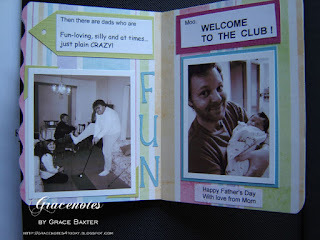 When my son, Matthew became a Dad for the first time, I wanted to give him something special. 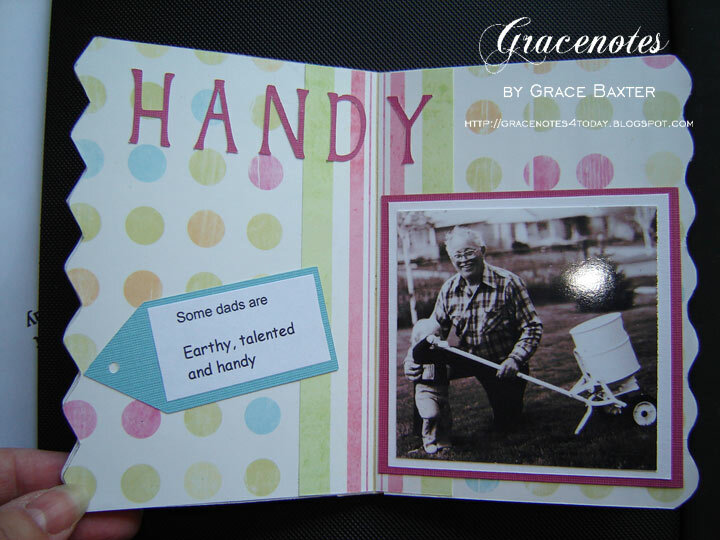 The little book I put together brings back memories of both grandfathers and his own dad. 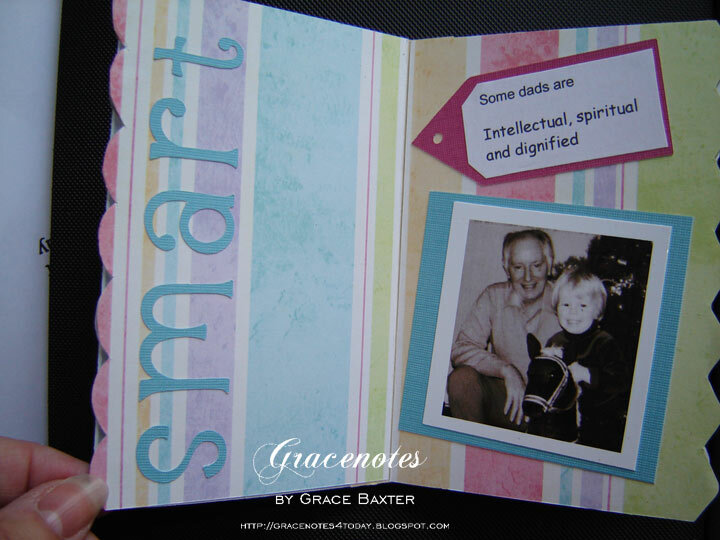 The pictures of Matthew with each grandpa and his dad tell a story. I could hardly hold back the tears as I was designing this Father's Day memento. 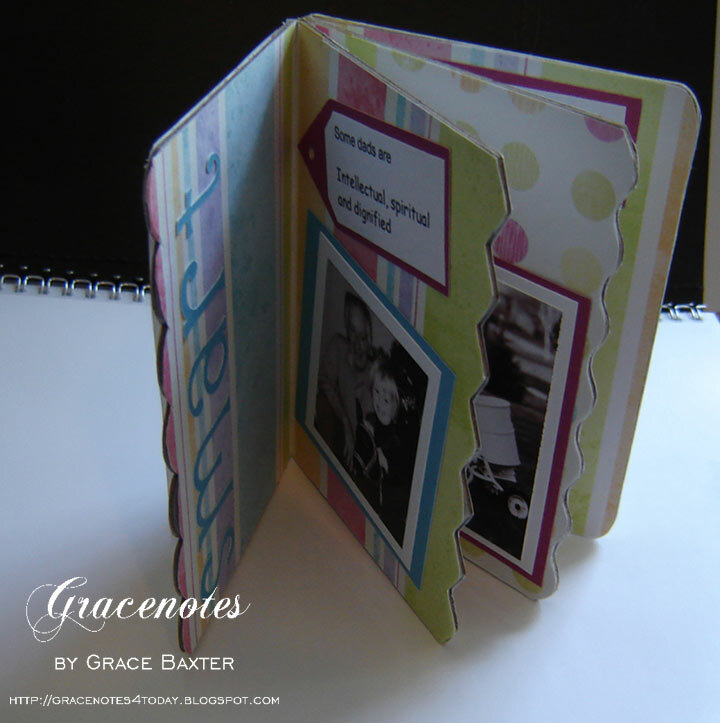 The book is chipboard, with each page covered in coordinated paper. 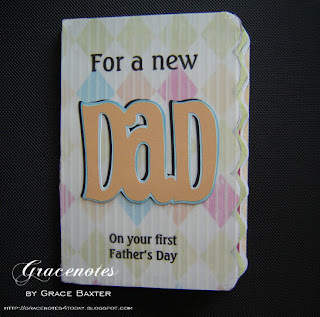 The front sentiment was printed on vellum, allowing space for the large "DAD" in the center, from Beyond Birthdays. After collecting and resizing the pictures I wanted to use, I thought about what each man's personality was like. Each of these role models in my son's life had their own special attributes and I wanted my son to never forget the kinds of men they were. For each page, I made a title befitting that person's page, and I created tags to tell their story. Titles are cut from my favorite font, Alphalicious. This project was so much fun to do. When it was completed, I could not stop looking through it, over and over. It brought back a flood of memories for me, remembering my Dad and seeing him in the picture with my son at age 1-1/2. Such precious memories. I know this little book will be treasured by my son for years to come. 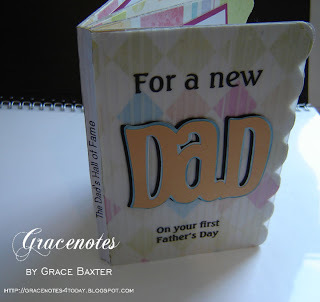 He may even pass it on to his boy, the newborn infant on the last page. What an amazing present, it will be treasured! Thanks for playing along with us at Fantabulous Cricut! Wonderful, wonderful, wonderful! Super fantastic, can I think of anymore words? What a treasured gift! Thanks for playing along with us at Fantabulous Cricut! 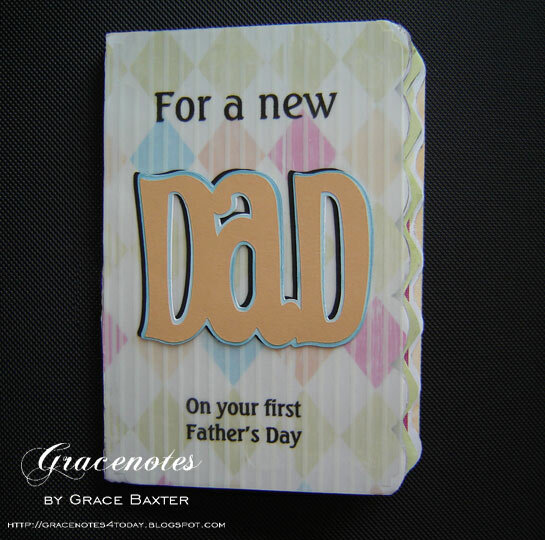 What a great gift for a new dad...he is sure to cherish this ! Thanks for playing along at My Craft Spot ! You just about make me cry telling the story of how much love went into making this wonderful keepstake. I am sure your son will treasure it forever. Lovely job! Thanks for joining in the challenge at My Craft Spot. What a fun idea! I LOVE it!! Thanks for joining the fun at My Craft Spot! This is such a treasure!! My eyes are misty reading this and seeing the pages. What a gift of love - and it looks fantastic!! What a lovely gift!! Thanks for playing along with us this week at My Craft Spot! !